The engineers at Team Daiwa have really outdone themselves with this top-line baitcaster, custom-made for Bass Pro customers only. Its free-floating drilled aluminum spool and incredible 12-bearing system (11 ball bearings + 1 roller bearing) combine for virtually effortless retrieves--in fact, you may need to concentrate a little harder when working a tube jig or twitch bait, in order to work them slowly enough! And with Team Daiwa's rigid 1-piece aluminum frame, swept handle and rock-solid 6-point drive train, you'll feel the power on every cast. Infinite Anti-Reverse; Magforce-Z automatic magnetic anti-backlash system; Soft Touch grips. "I bought one of these reels a few months ago and have been very happy with them. I usually fish with Zillions but decided to try this reel since it was on sale. I was a little concerned about some of the bad reviews but a couple of the detailed reviews were very good." "I absolutely love this reel. I've had it for about a year now. Its got a great feel to it and it performs as well as the Fuego for about half the price. I would definitely recommend this product." 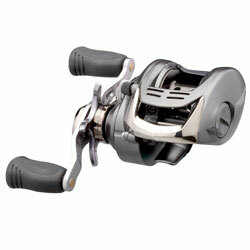 "I should have listened to the other reviews because I was very disappointed after I tried out this reel today. First of all it's very noisy on the cast. I could hear a squeaking noise when I was retrieving also. " "I bought one of these reels and one of the tierra's. Went home and was practicing with them both. The tierra was great then I tried this reel and it sounded terrible when casting. It sounded like all the gears where going to break and come flying out the reel or something."